Years ago I had a bowl of dreamy soup at Aqua in San Francisco. It was a lightly-hued lobster broth with eggplant dumplings, peas and tiny, perfectly round carrots. While I don’t remember exactly what the eggplant flavorings were, I do remember that the earthiness of the filling paired so nicely with the slightly sweet broth and I am pretty sure I made happy noises through that entire bowl. I have often wanted to try to recreate that dish, or at least make something similar. And in looking through the vegetable bin I opted for a mushroom broth which I thought would be interesting with a smokey eggplant filling. Peas and carrots would offer a nice bit of sweet and a last minute run to the store for watercress provided not only some nice color, but a peppery bite to freshen the palette. I started with the soup which I knew would need to simmer a while. The mushrooms were sautéed with a leek and some garlic until they leached their liquid, but before they could brown. I then added sake (which I thought would be nicer than wine in this case), water, soy and some dried porcinis. I let it simmer about an hour, skimming a bit of foam in the beginning. It was then time for the dumplings. Rather than fire up the grill, I charred the eggplant over a burner using a grate my husband had welded for this very purpose. I stabbed the eggplant skin a couple times as I have heard they can explode from the build up of steam and turned it all over until it was very soft. I then let it steam in a covered bowl until it was cool. The flakey skin was easy to peel and I noticed lots of slightly thickened liquid in the bottom of the bowl. I decided to chop the eggplant and let it sit in a strainer a bit to avoid some really soggy dumplings. The liquid was really interesting and I made a note to come up with a way to use it in the future…but then I left it on the counter all day so I will have to wait until next time. The eggplant was mixed with some garlic, ginger, green onion, hoisin and soy and stuffed some won tons in a variety of shapes. I steamed them for about 8 minutes rather than cooking them in the broth thinking it might be too much to infuse the salty mushroom broth into the wrappers. After about an hour the broth tasted perfectly deep and mushroomy so I strained it through a chinois and simmered some peas and carrots until the carrots were tender. It all went into a bowl with a little bunch of the peppery cress and was quite nice on a cool day. Sauté mushrooms, leeks and garlic until mushrooms have released their juices. Add sake, soy, dried mushrooms and water and simmer, covered, with the lid slightly cracked about an hour. Pour through a fine meshed strainer and return to pot. Add peas and carrots and cook until carrots are just tender. Char eggplant all over (on grill, under broiler, or over flame) until very soft being careful to not burn too much. Place in a bowl and cover with lid or plastic wrap to steam until cool. Peel and finely chop eggplant. Stir in remaining ingredients and adjust with salt if needed. Place a teaspoon of filling into a wrapper, wet edges and form in some fashion that suits you. 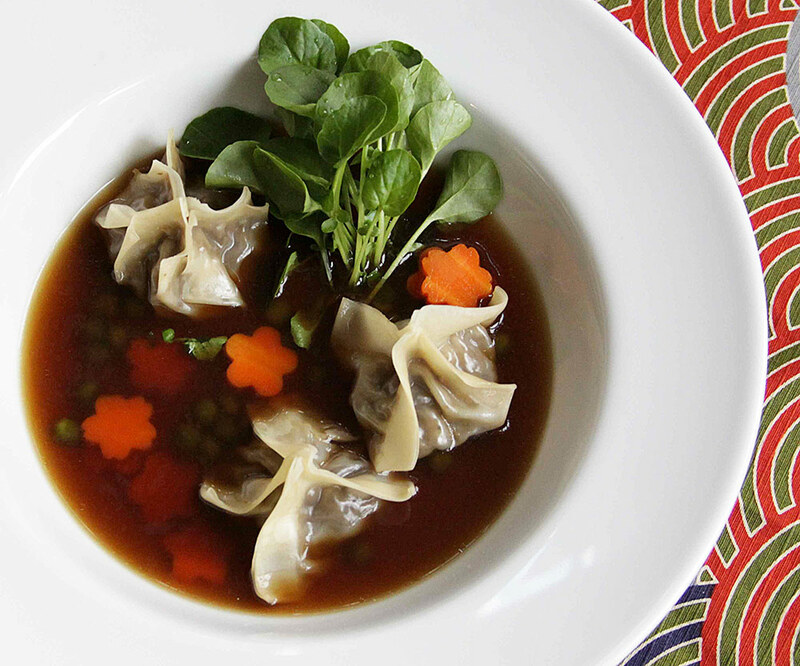 Dumplings can be simmered in soup or steamed separately (about 8-10 minutes). Serve with watercress and a few drops each rice vinegar and chili oil if desired. This entry was posted in Soulful & Simple, Soup, Vegetarian by Marina Chotzinoff. Bookmark the permalink. I have never eaten or heard of smoked eggplant dumplings, but it doesn’t matter! This sounds absolutely delicious! Great winter dish! Thanks a lot of sharing!